While we all love natural bait, lure fishing continues to excite many fishos. Each year we have an exciting new range of lures to choose from. 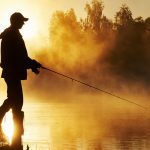 Going after your favourite fish with lures can be very rewarding and there is no better place to use fishing lures than around local estuaries. 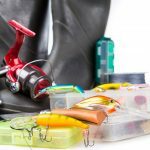 When thinking of fishing lures, many of us will naturally think about casting. Nevertheless, trolling is another effective way to fish with lures in and around coastal estuaries. If you are not getting results when casting from your kayak, why not give trolling a go? Kayaks are the perfect vessel for trolling lures. The average paddling speed is the perfect speed for trolling. Tailor and Salmon are present in most estuaries along the east coast. Both of these fish are predators often chasing small baitfish as their prey. Both of these fish will also move out into open water to chase their prey. Casting for these fish can present difficulties as both have habits of moving around. This makes them perfect targets for trolling on a kayak. Trolling is perfect for predatory fish that aren’t fussy, and Tailor and Salmon are perfect. We recommend soft plastic lures, such as Wiggly Tails. Go with a 10-12kg fluorocarbon mono leader. 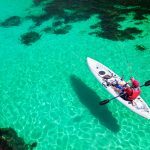 Trolling for Bream on a kayak really suits shallow lakes and creeks. Anywhere tidal waters and current flow are not as strong as large rivers or harbours. Shads and jerkbaits are great for trolling for Bream in these areas. Bream can be found in areas of open water but it is better to troll next to an area of structure. Another option is to troll around bridges and marinas. The advantage of trolling for Flathead is that you can use the same lures you troll for Bream. That being said, you should be trolling for Flathead in deeper waters because Flathead are more likely to be found on the bottom. Bouncing your lure along the bottom is highly recommended. Try trolling along channel drop offs and rock walls with some current flow near an estuary or creek mouth or try channels between sandflats. Wherever you find week or rocks is a great place to troll for Flathead. Thin profile fishing lures are best when trolling for Flathead because they resemble baitfish like Herring, smaller Mullet and Whitebait. 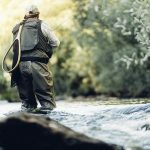 The advantage of trolling for any of the above species around estuaries, lakes and creeks is that fact you are likely to encounter a wide range of fish species. 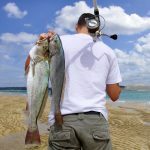 Trevally, Barramundi, Tarpon, Mangrove Jacks, Estuary Perch, Estuary Cod, Queenfish, Bass and Flounder can all be found in similar fishing grounds. Normal paddling speed is perfect when trolling from your kayak. You can add speed to see if you get more of a response. Tailor and Salmon respond well to slower speeds where Bream and Flathead will respond better to faster paddling. Keep you lure about 15m behind your kayak. Those predators that will chase your lure are those which are also interested in the sounds your paddling will make. If you want your lure deeper, let out more fishing line. Try trolling with a number of fishing lures and different lengths and therefore depth.